the Mississippi River and its many distributary channels. will complement existing restoration projects in the area. of the project to fit within the available CWPPRA funding. 9,679 linear feet of terracing. This project is on Priority Project List (PPL) 22. The goal of building terraces is to achieve some of the same objectives as full marsh creation but over a larger area of open water, where marsh creation alone is not feasible. Terraces are long, earthen berms that are built by mechanically dredging material and piling and shaping the material to a desired height. Most terraces average around 3 feet tall, with shallow side slopes and a wide base. This size and shape optimize the amount of terrace that falls in the intertidal zone and will support wetland vegetation. The objectives of constructing terraces are several and depend upon the location in which they are built. These include acting as a sediment trap to help build new land, reducing wave fetch and erosion on adjacent marsh shorelines, creating habitat for fish and waterfowl, and improving water quality to promote the growth of aquatic vegetation. Terracing projects constructed under CWPPRA have achieved each of these goals, with sediment trapping being most evident near the openings of sediment-laden bays or navigational waterways. Terracing has become a widely used technique that is expanding across the Gulf Coast because of the success and cost-effectiveness demonstrated through CWPPRA and privately funded projects. Although these features may not look like natural marsh and often use geometric configurations, they are able to perform a lot of the functions of natural marsh in areas that have become vast open water. Developing this cost-effective technique for use in areas that have few other restoration options is a testament to CWPPRA’s ability to adapt to funding constraints and a quickly changing environment. Significant marsh loss in the Cameron Meadows area is attributed to rapid fluid and gas extraction beginning in 1931, as well as Hurricane Rita and Ike. Rapid fluid and gas extraction resulted in a surface down warping along distinguished geologic fault lines. 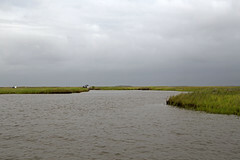 During the hurricanes of 2005 and 2008, the physical removal of the marsh coupled with subsequent low rainfall has resulted in the conversion of intermediate to brackish marsh to approximately 7,000 acres of open water. In addition to these losses, significant marsh loss has resulted from saltwater intrusion and hydrologic changes associated with storm damages. The goal of the project is to restore approximately 400 acres of coastal marsh habitat and reduce the fetch by constructing approximately 12,150 linear feet of earthen terraces. Sediment will be hydraulically dredged from the Gulf of Mexico and pumped via pipeline to create approximately 380 acres of marsh (295 acres confined disposal and 85 acres unconfined disposal). Funds are included to plant approximately 180 acres. Approximately 12,150 linear feet of earthen terraces will be constructed in a sinusoidal layout to reduce fetch and wind-generated wave erosion. Terraces will be constructed to +3.0 feet NAVD88, 15 feet crown width, and planted. Terrace acreage will result in four acres of marsh above Mean Low Water. The Cameron Meadows Marsh Creation and Terracing project is located in Region 4, Calcasieu/Sabine Basin in Cameron Parish, approximately five miles northeast of Johnson Bayou and five miles north of the Gulf of Mexico. This project is on Priority Project List (PPL) 22. The 30% Design Review meeting was completed July 2015 and the 95% Design Review was completed in October 2016. In January 2017, the CWPPRA Task Force approved CS-66 for Phase II Construction. The Louisiana Coastal Protection and Restoration Authority is the local cost-share partner that matches 15% of CWPPRA’s federal funding. On October 15, the U.S. Fish and Wildlife Service hosted the 19th Annual Wild Things Festival at the Southeast Louisiana Refuge Headquarters in Lacombe, La. This exciting family-friendly event gives the community an opportunity to engage in outdoor activities while celebrating National Wildlife Refuge Week. This free public event included canoe and pontoon boat tours, hayrides, live animals, wildflower walks, kids activities, bird house building, live music, and a youth wildlife art competition. The Coastal Wetlands Planning, Protection, and Restoration Act Public Outreach staff was among the 40 exhibitors providing hands-on activities to encourage knowledge of the Louisiana outdoors. In order to accurately portray the importance of aquatic, coastal regions, the CWPPRA staff utilized an ocean character, Sid the Restoration Squid, whose six unique legs each represented a different restoration method. The six restoration methods include barrier island restorations, marsh creations, shoreline protection, hydrologic restoration, freshwater and sediment diversions, and terracing. Each leg consisted of a distinct craft material that would correspond with a restoration method, in which children would assemble and personalize their own squid. Each child’s personal squid was accompanied by an explanation guide of CWPPRA’s efforts to restore, protect, and/or create Louisiana’s wetlands. From 1932 to 1990, the Caernarvon Mapping Unit lost 14,240 acres of its marsh. Prior to Hurricane Katrina, the greatest loss documented occurred between 1956 and 1974 and coincided with Hurricane Betsy and extensive canal building. Hurricane Katrina devastated the area resulting in substantial marsh loss. According to USGS Open File Report (2006-1274), approximately 39 square miles of marsh around the upper and central portions of Breton Sound were converted to open water by storm related scouring or submergence of the marsh. Because the framework of the marsh has been degraded, suspended sediments provided by the diversion move through the system and fall out where velocities are reduced such as in Big Mar and Lake Lery. The goal is to create terraces in the shallow open water areas south of Big Mar within the Caernarvon Diversion outfall area. Terraces will reduce wave fetch in the large open water areas and promote conditions conducive to growth of marsh vegetation and submerged aquatic vegetation. Additional benefits may be achieved through capturing suspended sediments. Marsh creation is also proposed to reestablish the western shoreline of Lake Lery in association with the Lake Lery Shoreline Restoration Project (BS-16). Approximately 65,000 linear feet of terraces (37 acres) will be constructed with in-situ material to reduce fetch and turbidity and capture suspended sediment. Sediments will be hydraulically dredged from Lake Lery and pumped via pipeline to create and restore approximately 334 acres of marsh in the project area. The Terracing and Marsh Creation South of Big Mar project is located about 5 miles south of Violet, LA in Region 2, Breton Sound Basin in Plaquemines Parish, south of Big Mar and west of Lake Lery. This project is on Priority Project List (PPL) 22. In 2013, BS-24 was approved for Phase I Engineering and Design.